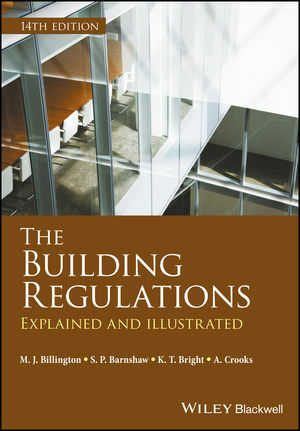 Since publication of the first edition in 1976, The Building Regulations: Explained and Illustrated has provided a detailed, authoritative, highly illustrated and accessible guide to the regulations that must be adhered to when constructing, altering or extending a building in England and Wales. This latest edition has been fully revised throughout. Much of the content has been completely rewritten to cover the substantial changes to the Regulations since publication of the 13th edition, to ensure it continues to provide the detailed guidance needed by all those concerned with building work, including architects, building control officers, Approved Inspectors, Competent Persons, building surveyors, engineers, contractors and students in the relevant disciplines. M. J. Billington, BSc, MRICS, MIoR, who has worked on various editions of this book since 1986, is a Chartered Building Surveyor. He was formerly Senior Lecturer in building control and construction at De Montfort University, Leicester, before leaving to join the private sector, where he continued to act as visiting lecturer at a number of universities. Currently he is Managing Director of Construction Auditing Services Ltd, a company that specialises in latent defects technical auditing, and is Chairman of Certass Ltd, one of the leading Building Regulations Competent Persons Schemes for building fabric. Mike is a regular contributor to Knights Building Regulations and is widely published in the fields of building control and building surveying. S. P. Barnshaw, BSc(Hons), MRICS, C.Build E, FCABE is Associate Director - Technical at jhai Limited. Qualified as a Chartered Surveyor and Chartered Building Engineer, Stephen has 30 years experience in the building surveying and building control profession. He has managed services within the private and public sectors and worked on a wide range of high profile buildings and frameworks. He has also been involved in professional training for many years and is Chair of an RICS professional membership panel. K. T. Bright, MSc, FRICS, FBEng, MCIOB, NRAC (Consultant), is Emeritus Professor of Inclusive Environments at the University of Reading and Visiting Professor of Inclusive Environments in the School of Art and Design at the University of Ulster. He has published widely in academic and practice journals and is the author and editor of several highly regarded reference books related to the development of inclusive environments. A. Crooks, FRICS, C.BuildE, FCABE, MIFireE is Chief Executive at jhai limited, one of the UK's largest approved inspectors. Andrew is a Chartered Surveyor, Chartered Building and Fire Engineer and has 25 years of industry experience delivering services within the private and public sectors on a wide range of buildings and frameworks. He is an RICS and CABE professional membership Chairman and Assessor and a member of the CICAIR Ltd Committees relating to the regulation of Approved Inspectors.